Our students, Novice, Hobbyist, Advanced Hobbyist, Seniors or Professional/Master have done very well for themselves at competitions. Ceramic greenware, bisque, open workshop, classes, seminars, kiln firing, supplies to finish your projects, competitions, custom painted gifts trophies and awards, Colors for Earth & Duncan paints. You can start your project from the greenware or with bisque, as in the “Contemporary Studios”. Full service studios are more versatile than contemporary studios since you can request wet greenware and do many different things to it. In contemporary studios your only choice is bisque (ready to paint ware). We host seminars with outside instructors and can do parties for groups (with advance notice). 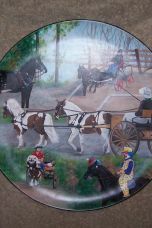 www.Horseramics.com I am still working on a catalog of ALL my greenware see Catalog. We pour all our own greenware and sometimes acquire pieces from other shops. We carry everything you need to finish your ceramic art creation. We are a Colors for Earth Education Center and dealer and carry Duncan Acrylic colors (non-fired colors) and Duncan Glazes. The shop is closed on all Federal Holidays or when I am attending a show (check the Shows/Seminars page or call). Tuesday mornings 9:00 am-12:00 pm. Copyright © 2009 MAD Ceramics & JR's Blue Ribbon Casting Slip. All Rights Reserved.